Magellan® RoadMate® Pro 9165T GPS navigation device designed especially for RVers. July 11, 2011 -- Recreational Vehicle enthusiasts preparing to hit the highways this summer will appreciate the special features built into the Magellan® RoadMate® Pro 9165T GPS navigation device, a portable unit designed especially for RVers. 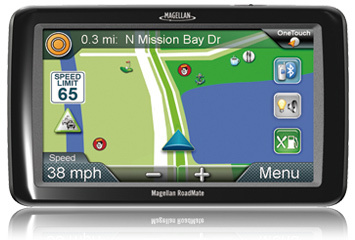 The Magellan RoadMate Pro 9165T is a full-featured, GPS navigation device designed for RV travelers with a high-definition, 7-inch touch screen; Heavy duty extension mount, Bluetooth connection to enable hands-free calling through the unit's speakerphone; and free lifetime traffic alerts that warn drivers of delays and suggest alternative routes. The new GPS device combines the core strengths of Magellan, the Good Sam Club, the world's largest RV Owner's organization and the Trailer Life RV Parks & Campground Directory. The Directory, a must-have tool for RVers, provides over 11,700 comprehensive listings for the U.S. and Canada which includes: WiFi and internet access, pet-friendly campground locations, the Good Sam Club discount locations, Trailer Life's exclusive triple rating system, and other points of interest specific to RVers. The Magellan RoadMate Pro 9165T GPS also features special route preference settings for RVs and large vehicles. After the user enters the vehicle's height, width, length and weight into the Magellan RoadMate Pro device, the unit will help the driver avoid such obstacles as low bridges, narrow roadway, and weight-limited streets. "The Magellan RoadMate Pro 9165T GPS has all the features to make navigating a large vehicle, like an RV, easier and more enjoyable," said Stig Pedersen, Senior Director of Product Management, Magellan GPS. "The device alerts drivers to traffic problems, calculates the best possible routes for their oversized vehicles, and promotes safe driving. We're thrilled to be teaming up with the Good Sam Club and Trailer Life Directory to incorporate features that are important to RVers, and help them find quality campgrounds wherever their travels take them." The Magellan RoadMate Pro features highway lane assist, spoken street names, multi-destination routing, and Magellan's customizable OneTouch™ menu for favorite places and searches. It includes Magellan's proprietary, built-in directory of more than 6 million points of interests in North America and Canada, from accommodations, coffeehouses and restaurants, to gas stations, shopping and health services. An A/V input in the device enables easy connection to back-up cameras, DVD players and iPods. "The Magellan RoadMate Pro 9165T GPS is the ideal navigation tool for RV drivers," said Marcus Lemonis, Chairman and CEO of Camping World and Good Sam. "Not only is it designed with features that make driving large vehicles more enjoyable, it helps campers find Good Sam certified campgrounds quickly and easily, so they can take advantage of their member discounts as they travel."